This is the second one of these I made. I never posted any of the work I had done on the first one because it was a 2011 Christmas present for my sister and brother in-law. So I didn't want anyone figuring out who it was for. I was probably being overly cautious. My sister loved it so much as a bedside table that she asked me to make another. This time for her husband's birthday. I had barely finished the first one in time for Christmas, I ended up putting the final coats of shellac on it in their basement after I had given it to them. It was still missing its drawer pull as well. This is straight out of Autumn 2004 Woodworking Magazine . 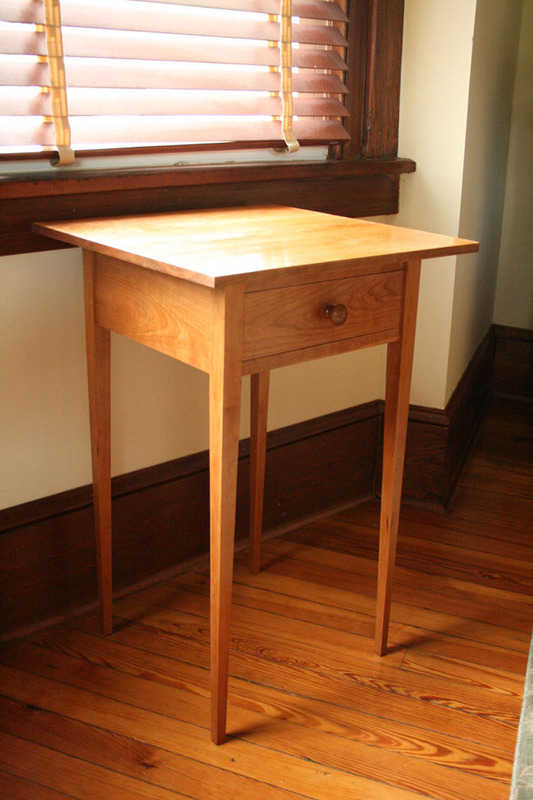 I've seen so many of these side tables in the shaker aesthetic, but this one I think looks the best. I think it's the proportions of the tapered legs and the bevel on the underside of the top that makes this design the most pleasing in my opinion. It makes the table look very slender. I've seen some that look way overbuilt and downright clunky. I figured the second one would go much easier than the first. In my mind, it did not. I made a few minor mistakes. However when I delivered the finished piece (OK I had to actually put the final coats of shellac on the second one in their basement... again!) I was able to compare the two. I was surprised to see that the fit and finish on the second one was a step above. 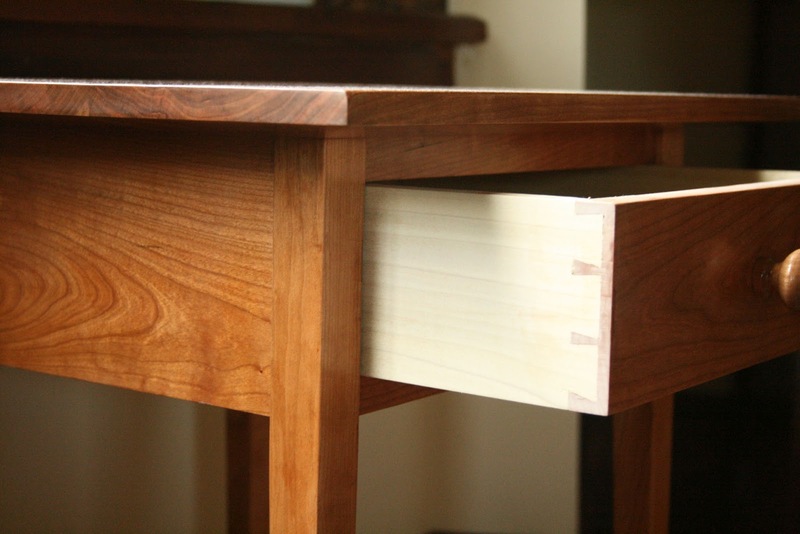 My dovetails where much tighter. The drawer action a bit smoother. Finally, solid proof that my skills are advancing. I really enjoy this project as it has many small challenges that helped add to my skill set. These two pieces were the first time I had actually built a drawer that fit into a carcass. I have to say that I think the action on these drawers is quite fine. The other nicety is that this is a small enough piece of "real" furniture that it doesn't challenge my tiny shop all that much. As is typical of my work, the raw stock preparation was done on my jointer and planer and bandsaw. The rest was mostly done by hand. The tapers on the legs were achieved by band sawing outside of the finish line then planing to final dimension with my jointer plane. The finish is shellac which is rubbed out with 000 steel wool and paste wax. I don't have any actual pictures of the construction on this one. I was so focused on keeping track of how long it took me to make it that I just didn't bother with pictures. It took me approximately 24 hours total. Not as fast as I'd have liked but not awfully long either.